Gov. 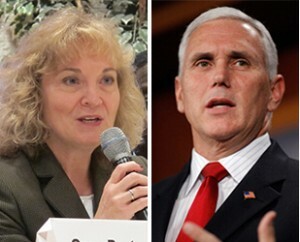 Mike Pence, state superintendent Glenda Ritz and Indiana General Assembly leaders laid out a roadmap for how they’ll meet the legislature’s looming deadline for re-writing the state’s A-F school rating system. Lawmakers had expressed concerns with the system — which assigns each school a letter grade based on their students’ performance on statewide tests — well before an Associated Press story raised fundamental questions about how former schools chief Tony Bennett’s staff calculated of the 2012 grades. 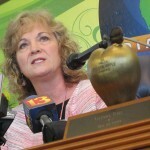 Ritz, they agreed, will co-chair a 17-member panel of educators and technical advisors, each appointed by the Department of Education, the governor’s office, and leaders of the Indiana House and Senate. I am grateful for the opportunity to work with Senate President Pro Tempore David Long, Speaker Brian Bosma, and Superintendent of Public Instruction Glenda Ritz to review and restore public confidence in our system of school accountability. The Accountability System Review Panel will make recommendations regarding revisions to the school accountability system, and I look forward to working together to create a fair system that families, community stakeholders, teachers and schools can embrace with confidence. Under the terms of the Memorandum of Understanding establishing the panel, Indiana’s Department of Education, Governor, House and Senate will each appoint one teacher, one principal, one superintendent and one “technical advisor” to the panel by next Wednesday, September 4. Long and Bosma will select one of these appointees to co-chair the panel along with Ritz.